It Was Like Christmas in July . . . . almost. 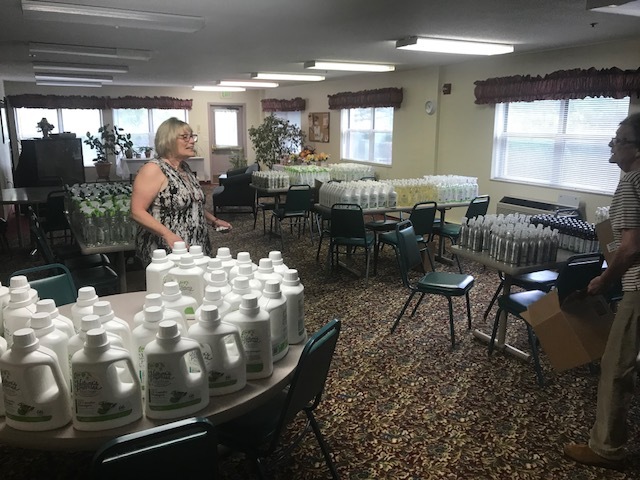 On August 1st, I had the opportunity to join Karen Adcock, our Senior Services Director, and Natalie Stasyk, our Program Coordinator at Meadow Creek Village Senior Apartments to distribute cleaning supplies and personal care items to its residents. Karen Adcock, Senior Services Director (left), works with a senior citizen at the residence who helped with the set-up. Earlier this year, a company in Auburn Hills that makes plant-based and chemical free products was shuttering their operations with plans of opening under new ownership. As a result, they donated hundreds of cases of items to the City and in turn, the City was able to provide many of these items to area non-profits that serve the residents of Auburn Hills and surrounding communities. The bulk of the items went to Rochester Area Neighborhood House in Rochester Hills and Grace Centers of Hope in Pontiac. But on August 1st, we reached out to a senior apartment complex to deliver items to them directly. Residents of Meadow Creek Village were given a cloth bag provided by the Senior Services Department and were able to go into a room where we had all the products on display to pick out what they wanted. Items included tub and tile cleaner, laundry detergent, air freshener, and much, much more. 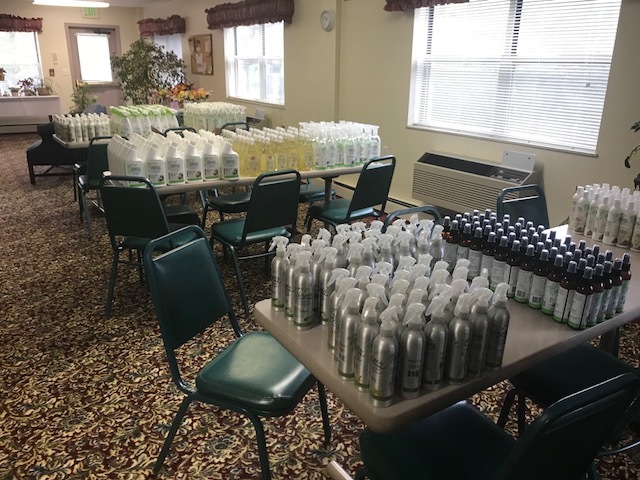 Plant-based and chemical free products given to the Meadow Creek Village Senior Apartments. Everyone was very excited to receive the items and certainly expressed their gratitude. We were happy to get these items into the hands of people who need them most. All our best to everyone at Meadow Creek Village.